Northern, NJ area, choose William. 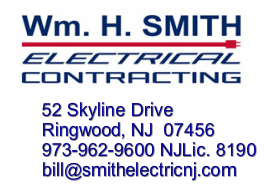 H. Smith Electrical Contracting. residential repairs and installations, generators, car charging stations, to commercial service upgrades and troubleshooting industrial factory machines, we service any type of electrical work. We are New Jersey state licensed (# 8190), bonded, and fully insured.